Jim Brodie, my series character, runs an antiques and art shop in Japan. Art inspires him. It grounds him. So I make my writing space fit his sensibilities. I write in two sessions—at home in the mornings, and in cafés in the afternoon. At home, I like a few places where my eyes can rest during a break, or during a pause as I consider a word, phrase, or plot point. On top of the black chest are two tea bowls and some African art, which I also have a great affinity for. Each Brodie book has some art and culture, which are woven into the story and the action. For the latest book, PACIFIC BURN, the art spotlight is on classic Oribe-style tea bowls used in the Japanese tea ceremony, a contemplative Zen-influenced ritual. Along the right side of the room and the bottom, you can see shoji paper screens over the windows. There is actually a window at floor level in this room. The paper lets in a soft diffused light. Depending on where the sun is I’ll keep the screen closed, or crack it open. As much as I like the quiet of home, too much makes me stir-crazy, so in the afternoon I’ll hit the coffeehouses for a change of atmosphere. I like the sounds, the movement, the buzz of the city, people coming and going. It’s all white noise to me and doesn’t distract, but whereas in the morning I am inspired by the art and the silence, in the afternoon I draw energy for the vitality of the city. 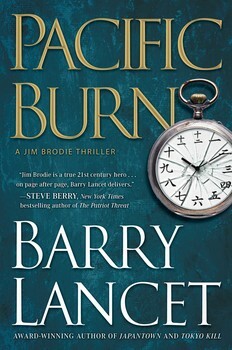 Barry Lancet’slatest book is PACIFIC BURN, the third entry in his international mystery-thriller series featuring Jim Brodie. The first book, JAPANTOWN, won the Barry Award Winner for “Best Debut Novel” and the second, TOKYO KILL, was a Shamus Award finalist for “Best Hardcover P.I. Novel.” The series is drawing considerable movie and television interest. Lancet divides his time between Japan and California.